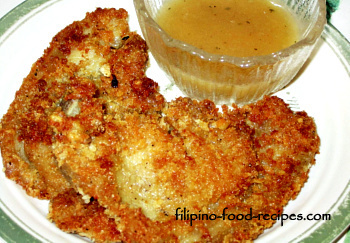 Anyone can do a breaded porkchop, just dredge in flour and egg and fry? True! But ever had one that is dry and chewy, or one where the breading falls off the meat? Since pork chops are from the pork loin, they are usually with little fat, very lean and tend to dry out when fried. If they are 1/4 inch or thicker, we usually make a brine of water, salt and sugar to keep them moist. Brining helps keep the meat moist during frying, and to flavor the meat, additional seasonings can be added into the brine. The meat is patted dry after brining, before dredging in flour, then in egg and lastly in bread crumbs. The flour is for the eggs to cling to, and eggs are for the breadcrumbs to stick to. The final step is just as important as the brining. For the breading to stick properly, we refrigerate the breaded chops before frying. 1 Mix together the brine ingredients and dissolve the salt and sugar thoroughly. Soak the pork chops for 30 minutes - 1 hour. 2 Remove the meat from the brine and pat dry with paper towel. 3 Dredge the meat lightly in flour and tap to remove any excess flour. 4 Dip in beaten egg and then dredge in breadcrumbs. 5 Refrigerate to chill for one hour. 6 Fry until golden brown. 7 Right off the fryer, sprinkle with a little salt and pepper. 8 Serve with ketchup or a side of gravy . Cut about 3 -4 quarter inch slits on the lower part of the pork chop(near the fat) to keep the meat flat and keep that side from curling. A flat piece of meat is necessary for even browning during frying. 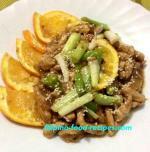 Do not brine a thin cut of pork chop or leave the meat in the brine for more than 1 hour, the porkchops could get salty. If the cut is boneless and just about 1/4 inch, or you simply want to skip brining, pound the chops to make them thinner -- then dredge and fry. For a thicker crumb coat, dip once again in the egg and breadcrumbs right after you refrigerate and before frying. 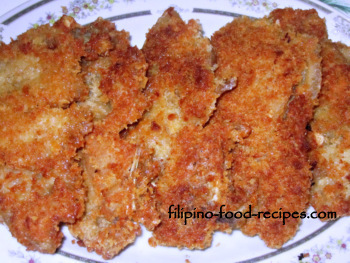 For a crispier breaded porkchop, use the Japanese breadcrumb, Panko or improvise by grinding and dipping in Skyflakes Crackers with cornstarch, but do not sprinkle salt after taking out of the fryer since the cracker is already salty. You could pretty much put any herb or seasoning that you want in the brine to flavor the meat. Try dried Rosemary or Sage or Thyme, experiment and see which one you like best. I like Thyme.